I would start a movement of radical self-love and self-worth that starts with our children. I read a quote somewhere that parents are often their child’s first bully and that hit me hard. We carry so much crap with us into adulthood and often have no awareness of how our patterning is affecting our children. My wish is to create a world where every child feels loved, nurtured, valued, safe, and supported. 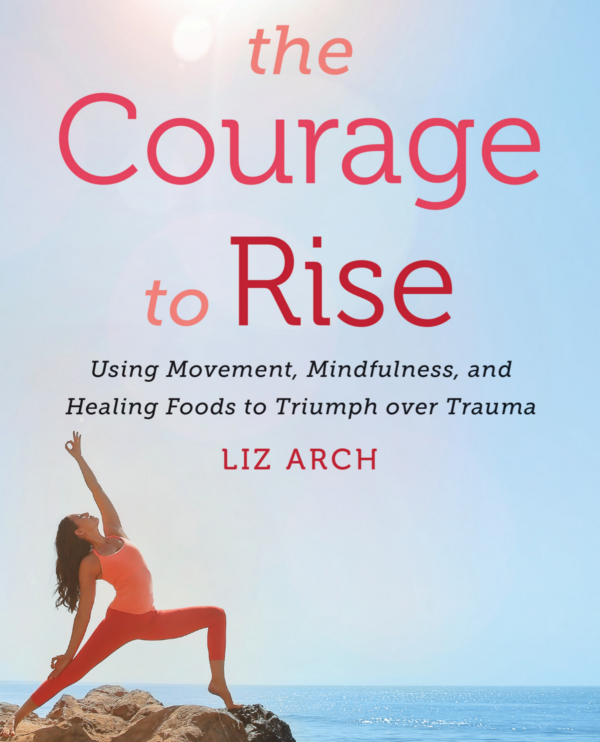 I had the pleasure of interviewing Liz Arch,international yoga teacher,author of the book The Courage to Rise, and founder of Primal Yoga®, a dynamic fusion of yoga and martial arts focused on empowerment and self-healing. Liz is also a certified Domestic Violence Counselor Advocate and currently serves as the West Coast director of the nonprofit organization Purple Dot Yoga Project, which uses yoga as a healing tool to help individuals overcome the trauma of domestic violence. She leads trauma-informed yoga teacher trainings, workshops, and retreats around the world. I never imagined that teaching yoga and becoming an author would be a part of my life’s path. The first yoga class I ever took was at a local YMCA in my hometown on Oahu when I was a teenager and all I remember is trying not to laugh as the teacher walked around the room demonstrating funny-looking poses and chanting in a language I didn’t understand. It wasn’t until I moved to Los Angeles and discovered Vinyasa Yoga that I realized yoga could rival the athleticism of any sport I had played. The physical practice was the initial attraction for me, but I soon realized that things were not only starting to shift on the outside, but were shifting on the inside as well. I have been through quite a lot of trauma in my life and had no tools at the time to work through it. I blamed myself for my failed relationships, my debilitating panic attacks, my anxiety, my rage, my grief, and my shame. Yoga became a guiding light for me on my healing path. It was a space for me to center myself, connect with my breath, and find a moment of presence in what often felt like chaos. Yoga led me to meditation where more profound shifts began to occur and somewhere along the way, I realized that this was always meant to be part of my life’s work. As an introvert, I loved that yoga could be practiced completely on my own. But I also began to realize that healing doesn’t happen in isolation. Healing happens when we feel seen, heard, held, and supported. So I started sharing bits and pieces of my journey through writing and found it to be incredibly cathartic. I also discovered that sharing my story not only helped myself heal, but it helped others know they were not alone. 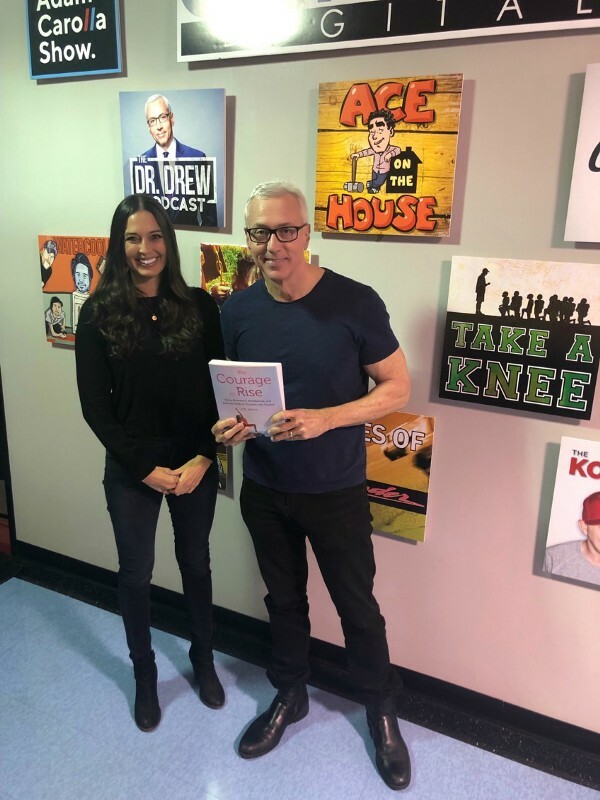 I believe that our biggest breakdowns can lead to our biggest breakthroughs and I feel so honored to be able to help share some of the healing tools I’ve learned along the way with others. Shortly after I started writing this book, I found out I was pregnant. The pregnancy was unexpected and I didn’t realize it at the time, but my boyfriend had started slipping into a deep depression. We decided to amicably split a few months into my pregnancy, so here I was, single, pregnant, and completely freaked out. My boyfriend’s depression deepened to the point of needing hospitalization back in his home state of Ohio and although we had decided to part ways, I still cared about him as a human being and the father of our child, so I was doing everything I could to hold it together. The irony is that I was writing a book about mental health and healing from trauma, while I simultaneously found myself in a situation that could be labeled as traumatic. I had a few moments during the writing process where I felt like a total fraud and would think to myself “How the heck am I writing a book about healing from trauma, when I’m standing in the thick of it?” But I believe that our pain can guide us to our purpose and for me, going through that challenging experience while I was writing the book created deeper insight and greater empathy for how I approached and conceptualized trauma and mental health. Our story also has a bright ending — my boyfriend ended up making it back to California in time for the birth of our beautiful son and helped to deliver him. With the help of family, doctors, therapists, and implementing healthy lifestyle practices like diet, exercise, and meditation, my boyfriend is healthy and thriving. He is an incredible father and a true testament to the resiliency of the human spirit. We have reunited as a family and I couldn’t be prouder to walk this path alongside him. I have made more mistakes than I can count and honestly, none of them have felt very funny at the time — more like totally embarrassing! But my biggest mistakes have led to my greatest growth, so I welcome mistakes now as part of the learning process. When I first started teaching yoga, I was so green! I would create the most haphazard sequences with no real understanding of the body. Nothing about my teaching in those early days was trauma-informed. I didn’t question anything and just regurgitated what my teachers before me had taught, misinformed adjustments and lame jokes included! I hadn’t yet found my own voice and I hadn’t yet found teachers and mentors who really resonated with me. I’m so fortunate that people continued to show up to my classes and stayed with me through some of those learning curves. I’m also so fortunate to have now trained with some of the most knowledgeable teachers and mentors in my field and grateful to be connected with amazing individuals and organizations who are collectively showing up and putting in the work to make the world a safer and more empathetic place. Outside of the book, one of my most exciting projects is my work with Purple Dot Yoga Project (PDYP). PDYP is a non-profit organization with a mission to support and empower individuals impacted by domestic violence and trauma using yoga as a healing tool. We offer free trauma-informed yoga programs to adults and children living in domestic violence shelters. We also offer a free one-on-one 8-week yoga program for survivors not living in shelters to help support their path to healing. In addition to our services for survivors, we offer trauma-informed yoga teacher trainings and host community events to raise awareness about this silent epidemic. This work is part of my soul’s purpose on this planet. I truly believe that healing happens in the context of community and it’s my greatest honor and privilege to be able to help individuals and families move from survivors to thrivers. I share a lot of my own personal trauma history, including surviving a flood as a child, and later my experience with intimate partner as an adult. But I’m also so grateful to be able to share the stories of so many other trauma survivors and thrivers in the book. The main message I hope readers take away from the book is that healing from trauma is possible and no matter how broken you may feel, healing and wholeness is your innate nature. I like to think of the book as a handbook of hope. It offers a wide variety of evidence-based healing tools including movement sequences, mindfulness techniques, and gut-healing recipes to help you learn to self-regulate your nervous system, strengthen your emotional resiliency, and ultimately transform your pain into your greatest power. The other message I hope people take away is that no matter what kind of trauma you’ve been through, you are not alone. You are worthy and your presence on this planet is no mistake. I think we’re at a unique tipping point in our world, where history is being made right in front of our eyes. I’m inspired by regular people who find strength from adversity like the students who survived the school shooting in Parkland, FL. They are proof that you don’t need to be rich or famous, or even over the age of 18 to start a revolution. I’m in awe of their unshakable resilience and their determination to use their voices to create action by demanding gun reform. It may sound a bit unconventional, but I draw the most inspiration from children’s books like the beloved classic, The Giving Tree by Shel Silverstein, and more recently, a beautiful book called What Do You Do With A Problem by Kobi Yamada. I truly believe that if we want to live in a kinder, more peaceful world, we need to raise kind and peaceful children. As a new mom, I love to read to my little one every night and have never been more aware that what I expose him to now will help shape his perceptions of himself, the people around him, and the world. So I appreciate authors who are sharing messages of tolerance, kindness, and mindfulness with a young audience. My hope is that my writing helps people to not feel so alone. Part of what makes trauma so destructive is the shame that often accompanies it. There have been so many moments in my life where I have felt out of control, unlovable, and unworthy. If I can share my experiences through writing and even just one person reads it and finds some hope there, then I have done enough. I never intended to become an author and considering how daunting the writing process was for me, truth be told, I’m not sure I want to tackle a second book. But that doesn’t mean I will ever stop writing. If your heart is calling you to write a book, do it! But also know that you don’t need a book to share your message and make an impact. In our digital age, there is so much power in sharing your writing online. You can start a blog or simply use social media as a platform to share your voice and connect with a worldwide audience. Sometimes we place higher value on something physically tangible like a book, but what I’ve come to realize is that a book is just one way and not necessarily the best way or the only way. Choose Courage Over Fear. Writing a book is not for the faint of heart and you will doubt yourself over and over again throughout the process. You will question your voice, your skill, and your message. You may even question why you decided to write a book in the first place. The greatest artists, creative minds, and storytellers have all written or spoken about self-doubt. The question is not whether you will doubt yourself, but whether you will choose to move forward in spite of it. Have a Support Team. When I first set out to write the book, I assumed it was a solitary task. I envisioned retreating to some writer’s cabin in the woods and not emerging until I had a manuscript in hand. But in truth, there were so many people involved in the process of conceiving, writing, and editing the book. On a professional level, it consisted of my literary agent, editors, and publisher. Without my literary agent, this book probably would never have come to fruition. She was instrumental in guiding me through the process and helping me land the publisher of my dreams. My book also included photos and recipes, so I had to bring on an additional team of photographers, hair and make up artists, a food stylist, prop stylist, recipe developer, and an assistant. Whew! The introvert in me wanted to hide, but I quickly realized it would have been impossible for me to take on such a big project without recruiting a team. Outside of my professional team, having a few trusted friends I could call on when I was experiencing writer’s block or plagued with self-doubt was instrumental in getting the book out in the world. I am so grateful for the people who cheered me on and encouraged me to reach the finish line. Know your WHY before you start. Get real with yourself about WHY you are writing a book. Bringing a book into the world wasn’t easy or cheap. While books can definitely be profitable and authors can no doubt make a successful living (hello, JK Rowling! ), writing is not necessarily the profession I would recommend if you’re looking to make a quick buck. Even if you land a fantastic publishing deal and receive a big advance, depending on what type of book you’re writing, you may not keep a penny of that money. I ended up getting a healthy advance, but spent the entirety of my advance on hiring the team I mentioned above. I had many sleepless nights throughout the process and moments where not only was my energy drained, but my bank account was drained as well due to production costs. Coming back to my WHY during the challenging moments was instrumental in keeping me motivated. My reason for writing was to share the tools of healing that helped transform my life with as many people as possible. If there is a story inside of you that wants to be shared, than it will always be worth it. Writing a Book is a Slow Process. Give yourself more time than you think you need. Writing a book feels like climbing a mountain. When you’re standing at the bottom, it feels daunting to look up and see just how far you need to climb. Take one step at a time. Create an outline and break down the book into smaller, bite-size pieces. Set mini goals and timelines for yourself, so that big idea you started with begins to feel a little more digestible and achievable. Have someone to hold you accountable in meeting your deadlines, whether it’s an editor, your publisher, or a friend. And build in an extra cushion for yourself when you inevitably miss those deadlines! Barack and Michelle Obama. I have always been impressed with their leadership, poise, elegance, and grace under fire. My mom was a huge fan of Barack Obama, and when my mother passed away, she received a letter from Obama and the White House offering their condolences. We have the letter right next to her ashes.